If you, your family and friends want to enjoy an old-fashioned wooden swing come rain or shine, consider the Cedar Wood Yard Swing Frame with Roof from Cedarwood Furniture. 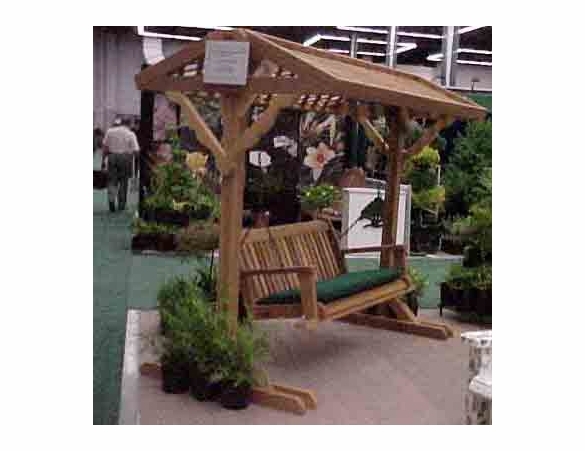 Available in two sizes — 84.5” or 90.5” — this Western red cedar swing with roof can accommodate a double swing while protecting the users from sun or rain. The included yard swing plans make assembly easy. Order this cedar frame unfinished or finished with a clear oil stain. If you need a new swing, use the dropdown box on this page to add a matching Cedar Villa Swing. Swing Sizes: Can Accommodate a 4' or 5' Swing. Add Clear Oil Stain to Ottoman? Add Clear Oil Stain to Table?